BORN: Brantford, Ontario, Canada, March 24, 1966. Selected by Toronto Maple Leafs as underage junior in fourth round (third Maple Leafs pick, 67th overall) of National Hockey League entry draft, June 9, 1984. Traded by Maple Leafs (with D Alexander Godynyuk, RW Gary Leeman, D Michel Petit and LW Craig Berube) to Calgary Flames for C Doug Gilmour, D Jamie Macoun, LW Kent Manderville, D Ric Nattress and G Rick Wamsley, January 2, 1992. Traded by Flames (with future considerations) to Hartford Whalers for D Dan Keczmer, November 19, 1993. Traded by Whalers to Tampa Bay Lightning for ninth-round pick (Ashhat Rakhmatullin) in 1996 entry draft, December 1, 1995. Traded by Lightning (with second-round (LW Pierre Dagenais) and eighth-round (RW Jason Bertsch) picks in 1996 entry draft) to New Jersey Devils for G Corey Schwab, June 22, 1996. Signed as free agent with Toronto Maple Leafs, January 5, 1999. Traded by Maple Leafs (with ninth-round selection (Milan Kopecky) in 2000 entry draft) to Tampa Bay Lightning for ninth-round selection (Jean-Phillipe Cote) in 2000 entry draft), August 6, 1999. Shared (with Rich Parent) James Norris Memorial Trophy, 1996-97. Named to International Hockey League All-Star second team, 1996-97. Named to International Hockey League All-Star second team, 1997-98. Holds National Hockey League single-game record for most assists by a goaltender (3), February 10, 1993. Suffered sprained wrist, January 22, 1987. The injury, which happened when Reese was struck during practice, was initially feared to be a broken wrist. Broke left kneecap; missed two months, October 23, 1989. Bruised left kneecap, April 12, 1990. Broke transverse processes; missed remainder of season, March 23, 1991. Cut hand in off-season, missed first three games of season, 1992-93. Strained shoulder; missed three games, October 31, 1993. Strained hip flexor; missed six games, December 23, 1993. Suffered from dehydration; missed one game, December 3, 1995. Suffered sprained right knee and ankle; missed three games, December 28, 1995. On February 16, 1992, Jeff was the goaltender who allowed Michel Goulet's 500th career National Hockey League goal. Selected by Toronto Maple Leafs in National Hockey League draft, June 9, 1984. 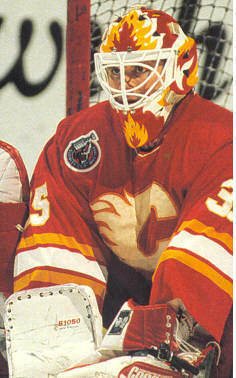 Traded by Toronto to Calgary Flames, January 2, 1992. Traded by Calgary to Hartford Whalers, November 19, 1993. Traded by Hartford to Tampa Bay Lightning, December 1, 1995. Traded by Lightning to New Jersey Devils, June 22, 1996. Signed as free agent by Toronto Maple Leafs, January 5, 1999. Traded by Maple Leafs to Tampa Bay Lightning, August 6, 1999.